Production for 2019 begins March 1st! The Feralvilla Small Feeding Station II allows food and water bowls to be protected from rain, snow & falling leaves. 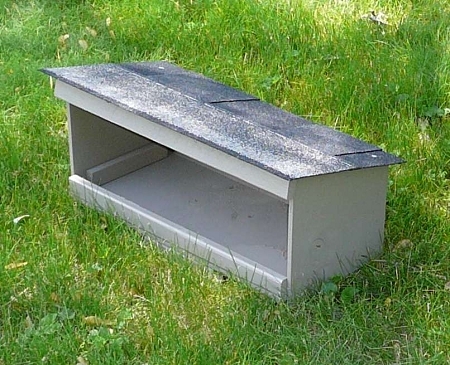 Unlike the FeralVilla Large Feeding Station, it is sized to fit into areas where smaller size is required for concealment and is just big enough to keep the food/water bowls out of the elements. Utilizing LP's patented SmartSide system, the Feeding Stations have a clean, uniform look with a beautiful wood grain texture. SmartSide is free from knots, voids or cracks and does not warp like traditional plywood. The proprietary SmartGuard process protects against fungal decay and termites. The manufacturing process uses all parts of the wood from trees, making it a much more Earth-friendly product than traditional plywood. The lower legs which come in contact with the ground are pressure treated. Thanks to the patented SmartSide system, we no longer offer painted Feeding Stations. The Feralvilla Large Small Station II comes with exterior surfaces pre-primed in a neutral tan color. The manufacturer of the siding material recommends that the siding be painted for maximum life. From our own experience, the siding will hold up for several years without being painted. If you wish to paint the Feeding Station, we recommend using a quality exterior latex paint. Despite being only about 12" high, the FeralVilla Small Feeding Station II is still nearly 24" wide and 10" deep, accommodating several food and water bowls. The floor is elevated about 1-1/2" above ground level on rot-resistant pressure-treated legs and the roof comes fully shingled. The FeralVilla Small Feeding Station II is shipped in a ready-to-assemble kit, and assembly typically takes about 10-20 minutes. All parts and illustrated assembly instructions are included. A cordless drill/screwdriver is strongly suggested.